Located on Peles brook valley, on the spot named Pietrele Arse (the Burnt Stones), the Peles Castle, the most famous royal residence in Romania, was built between 1875 and 1883 - when it was officially opened. It is said that sometime in august 1866 king Carol I arrived in the neighborhood, and spent the night at the monastery of Podul Neagului (as Sinaia was known at that time). He liked so much the wild and picturesque landscapes that he decided to built here a castle. So he bought the land in 1872, and then hired the German architect Wilhelm Dodderer to make the plans for the construction. That is why, in what concerns the exterior architecture, the main elements are specific to the German neo-renaissance style. Queen Maria’s Bedroom - Pelisor. Between 1889 and 1903, architect Karel Liman, who was in charge of the construction, built Pelisor Chateau - a modern and smaller replica of the main building - the residence of King Ferdinand I of Romania and of Queen Mary. The royal couple also lived in the Foisor Hunting Chateau for a while, building that was destroyed in a fire and was rebuilt again in 1933. A brief estimation shows that between 1875 and 1914 there were spent over 16 million golden lei for Peles. 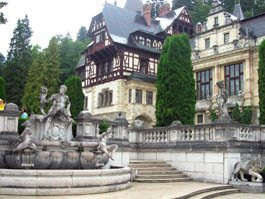 Both, at the end of the 19th century and nowadays, the Peles Castle was and is considered to be one of the most beautiful castles in Europe, and the first to be entirely electrified on the continent. Its own power station was located on the bank of Peles Brook. Otherwise, the building had, even at that time, an interior elevator, vacuum cleaner and central-heating system. The castle has 170 rooms, out of which only 10 can be visited by tourists, and shelters various valuable collections of paintings, sculptures, armours, carpets, furniture, tapestries, statues, potteries, gold, silver and china dishes, stained-glasses. The Entrance Hall is magnificent, with walnut tree carvings, covered with bas-reliefs and statuettes. The movable glass ceiling, activated by an electric engine or by a manual system, was a surprise element for the king’s visitors, who could admire the sky on cloudless summer nights. 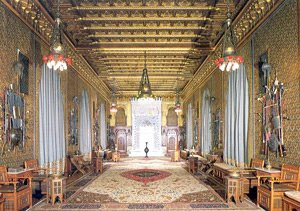 The rooms included in the touristic circuit have suggestive names, like Sala Maura (the Moorish Salon), the Florentine Room, the Columns Room, the Music Room, and the Armoury. 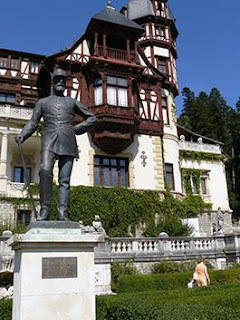 Peles Castle - The armouries. Peles Castle - Maura Salon. At first floor there is the Concert Room, arranged in 1906, where one can find a harpsichord made in 1621 at Antwerp, a Bluthner piano with vertical tail and a Rieger organ with two keyboards. The Imperial Suite was also arranged in 1906, for the Austro-Hungarian emperor Franz Josef, invited at King’s Carol I celebration of 40 years of reign. Peles Castle - Concert Room. Other rooms that offer the tourists various surprises are: the Council Room, which resembles one of the rooms of the mayoralty in Lucerne – Switzerland; the Work Cabinet where there is an imposing writing table and also an audience desk; the Dining Room, where there are exhibited some very valuable silver pieces, is at the first floor and has a rustic, Briton furniture from the 18th century; The Turkish Parlor which shelters a collection of Turkish and Persian brass pots; the Bedroom which is lighted by a Bohemia crystal chandelier. The stained glasses from Peles Castle were bought and set up between 1883 and 1914, most of them being brought from Switzerland and Germany, dating from the 15th and 17th centuries. 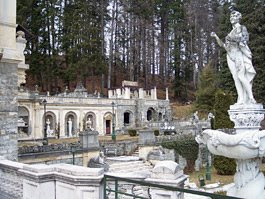 The castle also has seven terraces decorated with stone sculptures, fountains and Carrara marble decorative pots. Peles Castle - The Dining Room. After the Bran Castle, Peles Castle is considered to be the second most visited museum in the country. Only in 2006 there were over 250 000 visitors from our country and also from USA, Australia, Japan and New Zeeland. The importance of the castle is also underlined by the existing security measures: military guards, supervisors and video cameras. 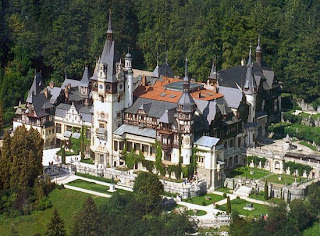 In March 2007 the Romanian Government gave back the Peles castle and Pelisor Chateau and the afferent lands to the Royal Family. Then, after a memorandum signed by the representatives of the Royal House and of the Government, it was agreed that the Peles Castle and the Foisor Hunting Chateau remained “forever”, as museums, in the property of the Romanian state. A story famous in the 80s said that the Ceausescu would have liked to have a protocol residence at Peles (the building was closed for the public between 1975 and 1990). Because it was well known that they had the habit of ordering all kinds of demolishing and renovations, the persons in charge of the museum scared them by saying that inside the Castle there is a fungus that attacked the wood and that it was very dangerous for man’s health. The truth is that there was indeed a fungus that affected the girders of the building because of the dampness and lack of airing. Cautious, Ceausescu husband and wife spent only one night at the Castle, sleeping in the Foisor. That is the reason why they started the restoration works, the resistance structure from the Honor Hall and the ground floor dining room being replaced. It is also said that Elena Ceausescu was the one who ordered the six pillows embroidered in silver and gold for the castle. At that time, the value of one pillow was that of a Dacia car, meaning 70 000 old lei. Visitors receive an extensive tour of the rooms at the ground and first floor, with guide in five foreign languages. 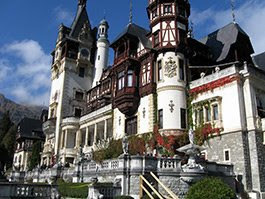 On November, Castelul Peles (the Peles Castle) is closed for general cleaning.